Hypericum calycinum Brigadoon is just the plant you're looking for to brighten up lightly shaded areas. 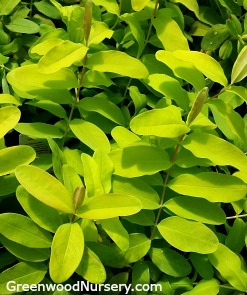 One of our best ground covers, the Brigadoon produces golden yellow green foliage with some tinges of red. Hypericum, or St. John's Wort, grows to about 15 to 18 inches with a 24 inch spread. Also called Aaron's Beard, the sturdy branches easily support the 2 inch yellow flowers that arrive in spring to early summer. An excellent deer resistant plant for sun to partial shade, warmer areas of zone 7 would be best to plant the Hypericum Brigadoon in partial shade. Hypericum Brigadoon ships in its 3.5 inch pots.